Spinal stenosis is a common condition in which there is a narrowing of one or more areas of the spine. This narrowing most often occurs in the neck or lower back. Spinal stenosis causes pain when the nerve roots and spinal cord become pinched or compressed due to the narrowing. The person may experience not only pain, but also numbness, weakness, and/or cramping. Females, people over the age of 50, and people who have had a previous injury or surgery of the spine are at a higher risk of developing spinal stenosis. Interestingly, not all patients with a narrowing of the spine develop symptoms. Depending on where the narrowing takes place, symptoms of spinal stenosis can occur in the neck, shoulder, arms, lower back, or legs. 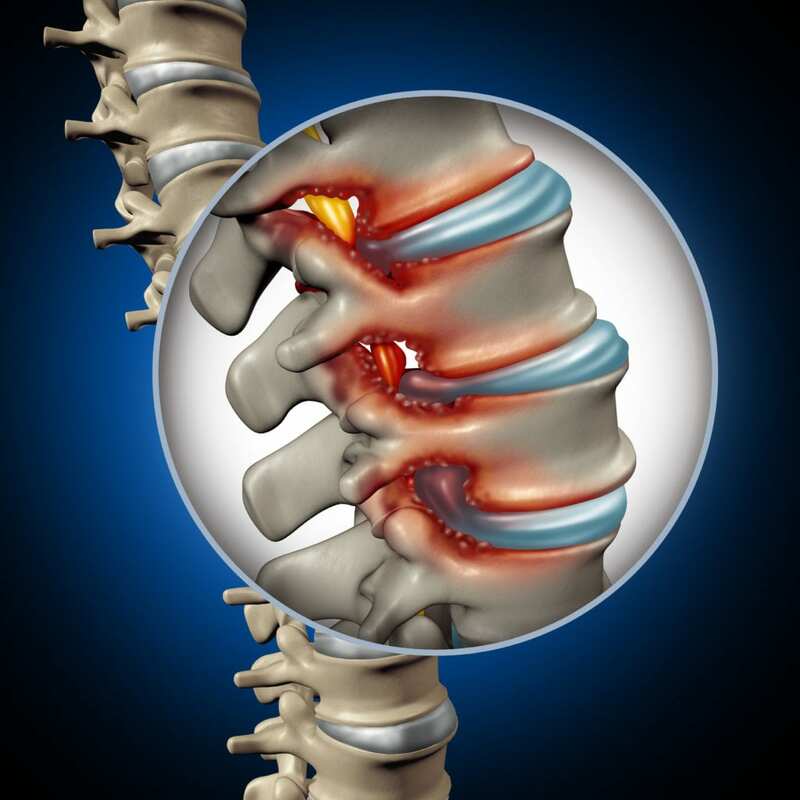 Most often, people with spinal stenosis complain of severe pain in the legs and lower back. Pain can often be so severe that walking even short distances can be unbearable, and walking up or down a hill or stairs can make the pain even worse. Leaning over or sitting down may temporarily relieve some of the symptoms. While there is currently no cure for spinal stenosis, there are steps you can take to reduce the pain and improve flexibility. Regular exercise is vital in the treatment of this disease. Exercise helps to keep muscles strong, improve balance, aid in the ability to walk and bend, and help keep pain to a minimum. Over-the-counter (OTC) medications like acetaminophen, ibuprofen, or naproxen can also be used to relieve pain. For severe pain or muscle spasms, your doctor may prescribe a stronger medication. Another treatment option is cortisone injections – also sometimes referred to as epidural injections. These are injected directly into the area around the spinal cord. For patients with severe or worsening symptoms, surgery may be an option. A decompression laminectomy removes bony spurs and bone buildup in the spinal canal, freeing space for the spinal cord and nerves. Your doctor may perform a spinal fusion to connect two or more vertebrae in order to better support your spine. Your choice of treatment will depend on how severely your spinal stenosis affects your day-to-day quality of life. If you have any questions or need treatment for your spinal stenosis, the highly qualified doctors at Orthopedic Associates of West Jersey are eager to help you. Give our friendly staff a call at (973) 989-0888 or use our appointment request form to schedule your consultation. We are fluent in English, Spanish, and French for your convenience. We look forward to meeting you and taking care of you.